It’s been 10 years, and the expression of talent and dedication we’ve seen through the Awards has increased tenfold, at the very least. I’m in awe of the continuous increase in passion, quality and innovation shown by the Finalists and Winners, and the accelerating breadth of engagement and support from entrants, judges, partners and the wider industry. It’s an honour to be a part of this solidarity. 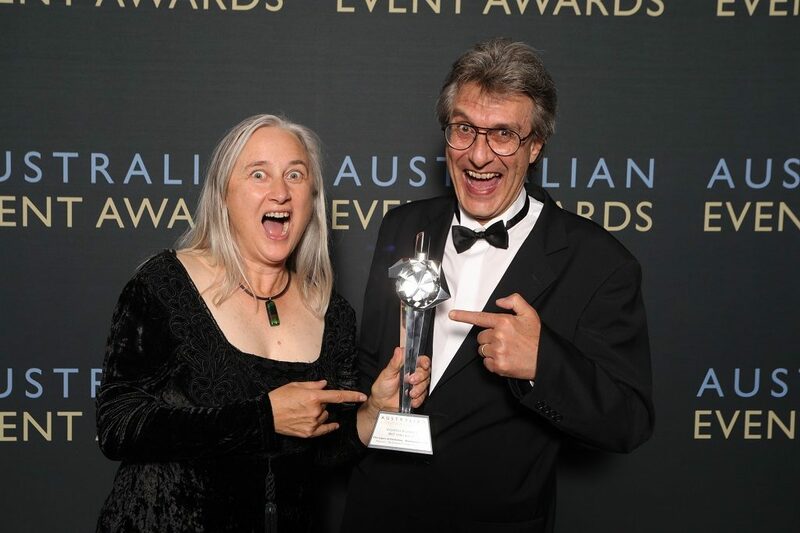 The Australian Event Awards celebrated this year’s Finalists and Winners, and ten years of the Awards program, with a bit of sass and sparkle on the Sunshine Coast. Sami Lukis delighted as the host for the evening, and there was a strong local line up of performers. Noosa Hinterland up-and-comer Emma Bridget Tomlinson opened the show with Fergie’s “A Little Party Never Killed Nobody”, setting the tone for a night of celebration, Adiamus String Quartet enhanced the glamour of the evening, singer-songwriter Clare Hennessy shared beautiful tunes, and local vocalists The Kitty Kats closed the evening, getting attendees up on their feet with their powerhouse musicality and cheeky charm. Events professionals from all sectors enjoyed entertaining banter as Lifetime Award Winner Ignatius Jones presented a few of the 23 Awards, and a broad range of other industry leaders enjoyed delivering trophies to the winners. There were many ecstatic recipients on the night, particularly Event Management Company of the Year winner Belle Laide Events; Wingman Events & Brand Activation, first ever winners of Small Event Management Company of the Year; and Natasha Gosper who was named Young Achiever of the Year. David Atkins, Lifetime Achievement Winner 2010, took out Event Producer of the Year for the second year in a row.